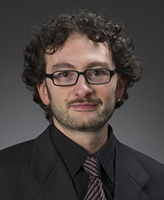 “Everything changed on October 3, but nothing really changed,” says Maurizio Albahari, assistant professor in Notre Dame’s Department of Anthropology. 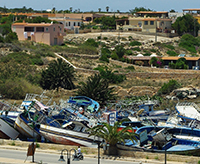 In October 2013, several major media outlets covered two tragic shipwrecks off the coast of the Sicilian island of Lampedusa—one on October 3 and a second on October 11—which killed more than 400 Eritrean and Syrian migrants trying to reach Europe. Following the first incident, CNN reached out to Albahari for a quote. Albahari, whose research focuses on international migration, organized crime, and interreligious dialogue, says he was grateful that the tragedies received so much media attention. He was concerned, however, that the events were characterized as isolated “emergencies,” rather than dramatic examples of a complex, growing problem that spans more than two decades. “You cannot possibly have an emergency lasting 20 years,” he says. “There is much more to it than that, which I have found in 10 years of research but also in more than 20 years of experiencing and remembering it as an Italian citizen. 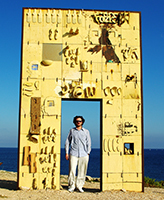 Maurizio Albahari at Porta di Lampedusa – Porta d’Europa. Artist Mimmo Paladino’s memorial to the maritime migrants who never made it to Lampedusa. While the original request from CNN was only for a short quote on the October 3 tragedy, Albahari says he instead worked all night on a longer commentary. Not only did CNN publish it in its entirety, but the network also invited him to write a second editorial on the issue. Albahari also contributed to pieces published by The New York Times and The Wall Street Journal, as well as a live interview with the BBC. The migrants—many from the Horn of Africa—are rational, Albahari emphasizes. Forced to flee authoritarian regimes and lifetime military conscriptions, they pay exorbitant fees and entrust their lives to smugglers because they have no better option. As a teenager in southern Italy, Albahari first became aware of the scope of the immigration issue in 1991—when a single ship made it to the coastal city of Bari carrying 20,000 Albanians. Termed the “sweet ship” in reference to its original cargo of Cuban sugar, the ship was hijacked in Albania and flooded with would-be immigrants. Growing up near the Strait of Otranto, which connects the Adriatic and Ionian Seas, Albahari remembers waves of migrants coming to Southern Italy—first from Albania, then from Yugoslavia and Kurdish regions in the Middle East, and eventually from Northern Africa. As he began his career, these experiences drew him to explore the underlying causes in more depth. While Albahari hopes that the October 2013 incidents may eventually be seen as a turning point in this crisis, the influx of migrants—and related deaths—currently continues unabated. At the time of his interview for this article, he noted that in the previous 48 hours, the Italian navy and air force had rescued 2,000 people in the Mediterranean Sea, and seven people had died en route to Southeastern Italy. Indeed, as of April 2014, 15,000 migrants have already been rescued by Italy this year, Italian Interior Minister Angelino Alfano told the Associated Press, with another 300,000 waiting in Libya to board smuggling boats. By illuminating the complexities of the problem, Albahari hopes to inspire his students, as well as the greater public, to action. At Notre Dame—with its long-standing tradition of Catholic social teachings—he feels his students are particularly willing and well equipped to effect change, through independent research and during study abroad and service programs. Ultimately, the solution cannot just be further “humanitarian-military” action or “smart border” technology, he says. It must be addressing the issue at a political level with widespread changes to immigration and asylum policy. That is where citizens can make a difference, Albahari says, by putting pressure on their politicians and making their voices heard. Albahari’s forthcoming book, Crimes of Peace: Mediterranean Migrations of Sovereignty and Salvation, examines the topic from both a political-legal and cultural angle, with particular attention to the implications of border enforcement and migrants’ death and detention. Originally published by Carrie Gates at al.nd.edu on April 16, 2014.